The best laid plans… | Working. Together. You know that day when you get up early, you are raring to go and then…yep! Following my normal plan today, I got up early was ready for my day and then, well my plans went astray. My day got away from me and all of the writing that I had intended to do was no more than a blank page. But sometimes it is tougher than just a blank page, missed assignment, or a later start because of an alarm clock that didn’t go off. How do you deal with that? Look, the reality is sometimes things are going to hit us like Alexander and Terrible, Horrible, No Good, Very Bad Day but it isn’t so much that it happens, but what you decide to do with it. Those days happen to us all. For some people, that bad day is a trigger for just about every bad habit in their book. For others, it is just a bump in the road that puts only the vaguest of imprints on their day. 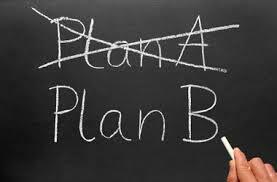 Plans are great, but they often will fail. The big question is how will you be ready to pick things up after they fall apart? Success in life isn’t always the big things that we think they are, it is doing the small things well, even when the odds are against us. How are you working to overcome even the bad days or the plans that have gone astray in your own life?